Lush indigenous forest shades the private cottages – each crafted by hand from local materials, to ensure they blend seamlessly into this unspoiled landscape – while through the trees Lake Victoria winks her welcome. A hammock sways in the gentle breezes coming in off the Lake, while the swimming pool vies for your attention. Lace up your boots for island adventure, wander down to the nearby beach, or simply settle into an armchair with binoculars and a bird guide and let the wildlife come to you. At Rubondo, the wilderness is never far off. It’s a rare privilege to set foot on Rubondo. For decades the island – the largest island-based national park in Africa – has been a refuge; for threatened chimpanzees, for families of elephant and the shy sitatunga antelope. Lying in the south-western corner of Lake Victoria, the island is 26 kilometres in length and ranges from 3 km to 10 km in width. Over three-quarters of Rubondo’s 25 000 hectares are blanketed by pristine and untouched equatorial forest. Bar a handful of park wardens, wildlife researchers and camp staff, the island is uninhabited by humans. This unique corner of Africa is more importantly set-aside as a refuge for wildlife, a sanctuary to be enjoyed by just a handful of fortunate – and intrepid – travellers. This small and exclusive camp of just eight luxury cottages – all built by hand, using traditional skills and local materials to ensure a light footprint on the island’s delicate eco-system – offers unrivalled access to this one-of-a-kind destination, with forest walks, game-watching, birding excursions, canoe trips, trekking through wild chimpanzee territory, catch-and-release fishing and a host of other eco-sensitive activities. If you’re a seasoned adventure traveller or safari goer who has seen it all, just wait until you lay eyes on Rubondo Island. Rubondo Island Camp is an exclusive lake front property ensconced under a shady forest canopy with superb views across Lake Victoria. The former camp has been removed and replaced with more comfortable and upmarket facilities. An elevated outcrop of rocks amidst scattered trees provides the perfect setting for the new dining and lounge area, offering a splendid view of the lake and bay. A swimming pool surrounded by decks is located close to the beach and common area. The eight new luxury accommodation suites or chalets will be nestled under the huge trees just 60 metres from the sandy lakeshore. We have 3 large new suites ready since December 2012. These stand alongside 5 existing luxury tents under thatch. These and the new suites are being enjoyed by guests during our “soft opening” phase. Gradually the existing luxury tents are being replaced by the larger suites and the camp will be completely ready by June 2013. The short flight from the plains of the Serengeti shows off Rubondo in all its glory: sandy beaches roll into lush woodland that shelter hundreds of indigenous and migrant bird species. Genets, cats and otters dart between the shadows in search of prey, while herds of elephant and giraffe move gracefully from forest to savannah. In the cloak of virgin forest families of chimpanzees forage undisturbed, while papyrus swamps host the secretive sitatunga; a semi-aquatic antelope that should be on the must-see list for any seasoned safari traveller. There’s delight in the detail too: from November to March wild orchids bloom in the forest, attracting a dazzling array of butterflies. Open your eyes and ears and the island’s remarkable frog populations spring to life. Rubondo Island National Park is a twitchers paradise with over 300 endemic and migratory species. This fully protected Island National Park provides exceptional habitat variety ensuring there is always something new to experience or record. And of course, surrounding Rubondo on all sides, there are the waters of Lake Victoria, with the island providing a crucial breeding ground for tilapia and the massive Nile perch. This is one of the most undisturbed ecosystems in Africa; a paradise left to its own devices for decades, and today, one of the most remarkable wilderness destinations on the planet. Rubondo Island offers superb reward for the adventurous and active where days can be spent exploring the pristine forest and water around the island. With easy access to Rubondo’s unique island ecosystem, the selection of activities for camp guests is focused around discovering and enjoying the remarkable wilderness areas found across the island. Highly trained Asilia guides lead guests on forest walks and guided game excursions, with an astonishing array of birdlife waiting to be discovered. One of the most popular options is the guided chimpanzee experience, where guests are introduced to an area of the island home to the families of wild chimpanzees. Although sightings can never be guaranteed, the chance to explore the chimps’ unique habitat makes this an unforgettable activity. The island is also a hub for chimpanzee research, and members of the research team are often in camp to share their discoveries with guests. Activities aren’t restricted to dry land either, with memorable canoe excursions making for a magical way to discover and appreciate the island. The waters around Rubondo are also a haven for tilapia and the famous Nile perch, a sought-after game fish that attracts anglers from across the globe. Asilia Africa promotes catch-and-release fishing to conserve Lake Victoria’s precious fish stocks. 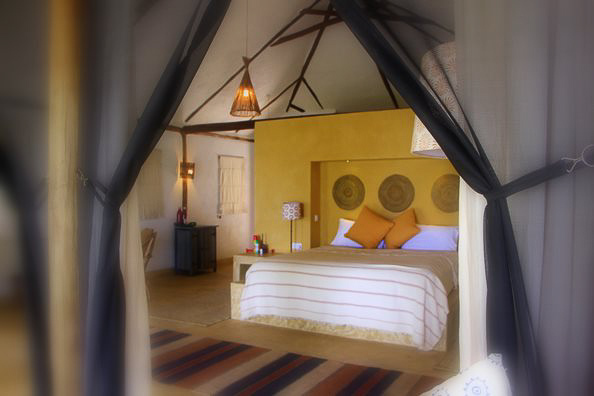 Rubondo Island Camp is a very recent addition to our portfolio. Asilia’s aim is to structurally improve the prospects for the area. Turning Rubondo into a profitable sustainable travel destination will have many local economic benefits. At present we are identifying which projects benefiting local communities and natural habitat we will support. Some key initiatives are listed below. The island’s pristine forest is the home to wild chimpanzee, introduced here in the 60′s to benefit from its remote, protected habitat. To provide scientific data, crucial to the long-term survival of these close cousins, Asilia set-up the Chimpanzee Project, led by Nadejda Josephine. Several communities live on the neighbouring island of Kisenyi. We are in the process of setting up programmes for the local clinic’s HIV education project and identifying how best to provide educational support to local primary schools. More news will follow soon!